Donald Trump has drawn a lot of attention in a slow-starting race for the GOP nomination. Roughly a quarter of all Americans (26%) name Trump as the possible Republican presidential candidate they have heard most about lately, far more than volunteer any other candidate. 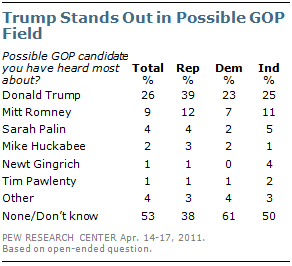 Among Republicans, 39% name Trump as most visible – more than all other possible GOP candidates combined. To be sure, Trump is standing out in a contest that has yet to draw much public interest or media coverage. In fact, about half of all Americans (53%) could not name anyone when asked which GOP candidate they have been hearing the most about. Overall, just 20% of the public say they followed possible candidates for the 2012 presidential elections very closely last week and just 4% named it as their most closely followed story. 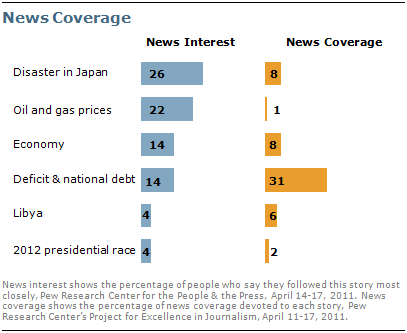 The disaster in Japan was once again the most closely followed story (at 26%), according to Pew Research’s News Interest Index. The survey was conducted April 14-17 among 1,015 adults. The 2012 race also was overshadowed by other stories – particularly the ongoing debate about the federal budget deficit and national debt. The deficit debate accounted for 31% of all news coverage, according to a separate analysis by the Project for Excellence in Journalism (PEJ). By contrast, coverage of the presidential race accounted for just 2% of the newshole. While the budget debate drew the most news coverage, it did not attract a great deal of public interest. Slightly more than a third (36%) followed this story very closely, while 14% said it was the news story they followed most closely last week. Asked about their impressions of coverage of the budget deficit and national debt, fully 73% say that deficit news seems to be the same all the time with nothing ever really changing. Another 55% say they often feel they do not have enough background information to follow budget news stories. 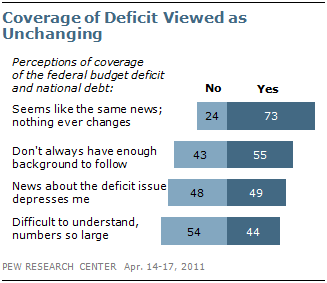 About half (49%) say that news about the deficit issue depresses them. Fewer than half (44%) say that the large numbers involved in following the deficit issue make it difficult to understand. For a majority of Americans (54%), the vast amounts involved are not an impediment to understanding the deficit. While the media focused squarely on the federal budget and broader debate in Washington on how to address the deficit and national debt, the public expressed greater interest in the aftermath of the earthquake and tsunami in Japan and news about rising fuel prices. About a quarter (26%) say they followed news about the tragedy in Japan most closely, making this the public’s top story last week. Japan shared the top spot one week earlier with news about the threat of a government shutdown over budget disagreements. This past week, rising domestic gas and oil prices also captured more attention than the federal spending debate in Washington. Nearly a quarter (22%) followed fuel prices most closely and a majority (53%) reported following this news very closely. The media devoted just 1% of all coverage to this issue. News about economic conditions was the top story for 14% of Americans. More than four-in-ten (44%) followed economic news very closely. These stories accounted for 8% of the newshole. About a third (36%) followed news about the debate in Washington over federal spending very closely last week and 14% followed this most closely. Media coverage far surpassed interest in these stories, accounting for 31% of the newshole. Public interest in addressing the nation’s finances declined from the previous week, when 47% very closely followed the threat of a government shutdown because of budget disagreements. Interest in events in Libya reached its lowest point since the conflict between Col. Gadhafi’s government forces and armed rebels began in March. About two-in-ten (21%) say they very closely followed news about events in Libya; 4% say this was the news they followed most closely. Stories about Libya accounted for 6% of coverage. The 2012 presidential election is attracting only modest interest in this early stage of the race. Two-in-ten (20%) are following very closely and just 4% said news about potential 2012 candidates was their most closely followed story. Campaign news interest is now on par with interest at this point in the 2008 presidential race. In April 2007, 18% said they were following election news very closely. These findings are based on the most recent installment of the weekly News Interest Index, an ongoing project of the Pew Research Center for the People & the Press. The index, building on the Center’s longstanding research into public attentiveness to major news stories, examines news interest as it relates to the news media’s coverage. The weekly survey is conducted in conjunction with The Project for Excellence in Journalism’s News Coverage Index, which monitors the news reported by major newspaper, television, radio and online news outlets on an ongoing basis. In the most recent week, data relating to news coverage were collected April 11 to 17, and survey data measuring public interest in the top news stories of the week were collected April 14 to 17, from a nationally representative sample of 1,015 adults.